After the big Galaxy Note 9 event, Samsung has announced it’s new sleek tablet Galaxy Tab S4 at Manhattan on August 1. And this is not the only tablet, the company has also announced Galaxy Tab A 10.5 for kids! This is surely exciting news for all you gadgets lovers. The company is trying to beat the iPad at productivity. 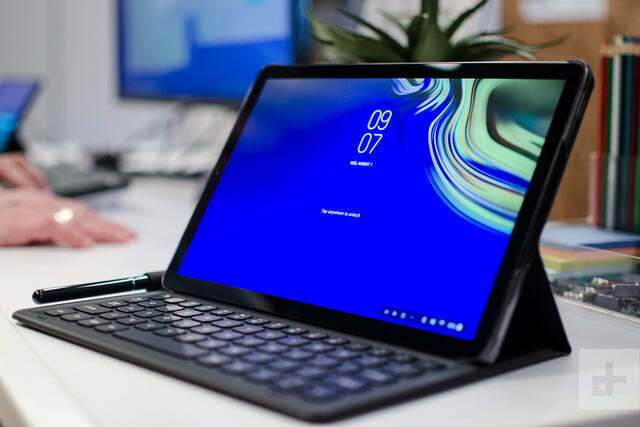 Galaxy Tab S4 can be attached to a special dock – called DeX. This means you can hook your tablet up to a monitor, keyboard, and mouse. It can also use a special mode that effectively turns your Galaxy Tablet into a desktop. DeX helps consumers to enjoy the best features. You can open multiple desktop-style windows for your Android apps and re-size them when needed. Drag and drop content between apps. You can also use keyboard shortcuts for better efficiency. As soon as you plug in a monitor, the Galaxy tablet itself becomes a trackpad. The tablet is available with either 64GB/256GB of built-in storage which will cost around $650 and $750 respectively. There is an S Pen with the tablet. Like Apple’s iPad Pro, Galaxy S4 Tab includes 4 speakers (tuned by AKG). The Tab S4 will ship from August 10th. There are two color options – glossy black and white with preorders. The S4 Tab features a 10.5-inch Super AMOLED display along with a 16:10 aspect ratio. Its bezels are slimmer than it’s predecessor. Iris and face scanning features are available in addition to passcode option. Up to 16 hours of battery life with 7,300mAh battery. The Tab S4 runs Android 8.1 Oreo and includes a 4GB of RAM. Powered by a last-gen Snapdragon 835 processor. A 13MP cameras on both the front and back side. There’s a USB-C port, microSD slot, headphone jack, and a pin-connector for the keyboard. Samsung has integrated far-field microphones into the device. The company unveiled a tablet for Juniors- Galaxy Tab A 10.5. As compared to Tab S4, the Tab A 10.5″ is thicker, heavier, and taller. Samsung chose to go with a TFT LCD over an AMOLED. The tablet can be used by the whole family by using a Multi-user mode. The Always On Daily Board shows the time, calendar, weather info, and photos. The quad speaker system is similar to that of Tab S4, which is enhanced with Dolby Atmos support. The Tab A 10.5″ will come in blue, black, and white color variants. No pricing or availability information is out. It features a Snapdragon 450 and 3GB of RAM. The tablet is packed with a 7,300mAh battery. There is an 8MP rear camera and a 5MP front-facing camera. There are four Dolby Atmos-powered speakers which give a good audio experience. Expected to run Android 8.1 Oreo. Unfortunately, there is no fingerprint sensor. Cheaper than Galaxy Tab S4. So, let us know which one is your favorite? Stay connected for more such updates. Flipkart exclusive Samsung Galaxy On6 launch on 2nd July Samsung Galaxy On6 with infinity display launched Samsung Galaxy J8 – Sale starts on 28th June! Samsung Galaxy Note 9 – Rumors, release date and specs.